Soft stretch jersey Easy lift up nursing Front tie detail Above the knee Chic, simple and effortlessly versatile, our essential Front Tie Maternity & Nursing Dress will make a smart addition to your new closet – perfect for everyday wear or office to evening style. 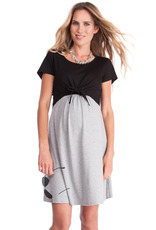 This maternity dress offers an easy-care, easy to wear option in the softest stretch jersey, designed to drape beautifully over your bump. Perfect before, during & after pregnancy, stylish ties secure at the empire waist to frame your new curves & highlight your slimmest point. After baby is born, simply untie & lift up to gain easy access for nursing.